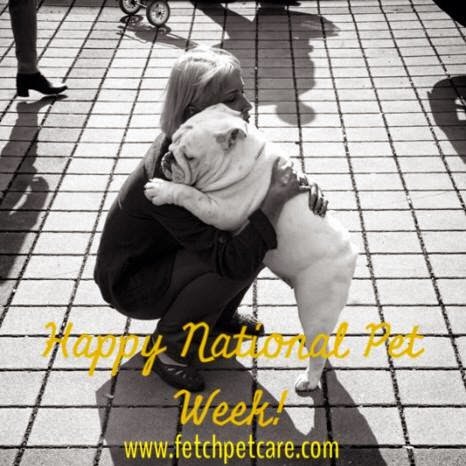 This is National Pet Week and Fetch Pet Care is celebrating by creating a short video collection of everyone's pet photos. Send your pet's photo to Erica at social@fetchpetcare.com by May 9th. I love this photo they are using on their facebook campaign! Fetch Pet Care is a wonderful dog walking and pet sitting service that I've used for years. They've helped me numerous times when I've been traveling, as well as many days when I'm having a bad Lupus flare and unable to walk my pups. They have locations across the United States. Great service and I highly recommend them! National Pet Week's website has a wealth of information and great tips for pet owners. Be sure to pay them a visit and learn how to be an even better pet parent! Happy Dog & Pet Lovin'!